Smoking on site can have a negative impact on both the appearance of sites and the environment, though this second consideration is not always addressed. Cigarette waste is not often recycled as it is difficult to recycle. 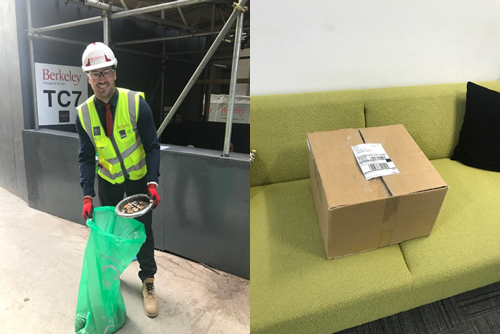 The site collected cigarette waste and sent it to TerraCycle, a recycling company who provide free waste collection programmes for hard to recycle materials. Through TerraCycle cigarette filters are washed, shredded, and combined with other plastics to create signage and plastic ply alternative products e.g. table tops and hoarding. The ash and other biodegradable elements are turned into compost. This follows the waste hierarchy for waste disposal better than sending the waste to a materials recovery facility (MRF) because the waste is recycled into products rather than being used for energy. For more information about TerraCycle, click the link below. Monitor report. Berkeley Homes (North East London) Ltd. London. August 2017.